To understand how and why earnings reports matter, we should start by looking at the process. Publicly traded companies are required to report on their performance at “regular” intervals. In the US, the reports have to come every quarter, with full financial statements filed with the SEC. The degree of disclosure varies across markets, both on timing (quarterly, semi-annual and annual) and on information (partial reports of performance in some regimes). The reporting ritual is highly scripted, at least in the US, in terms of timing (companies report earnings on about the same date every year, give or take weekends, and in the same format to allow for year to year comparisons). The initial report provides the bare bone details (revenue growth, earnings per share and a breakdown of a few extraordinary items) and is followed a few weeks later by the full filing of the quarterly report (10Q) with the SEC. Since earnings reports contain information that can affect prices, the SEC does regulate trading and disclosure around the reports. Insiders are restricted from trading before earnings announcements and Regulation FD bars firms from providing information about upcoming earnings reports to subsets of investors (analysts). In theory, at least, the information in an earnings report should be “news” to markets. When a company does report its earnings, markets will react to the “news” in the report but the way we measure the news has to be relative to expectations. 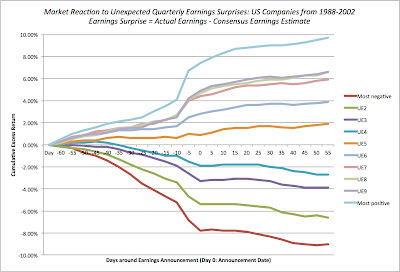 Thus, a company that reports that its earnings went up by 30% may be seen as delivering bad news, if investors were expecting an increase of 40%, and a firm that announces an earnings decline of 30% may be providing positive information, if the expectation was that earnings would decline by 40%. 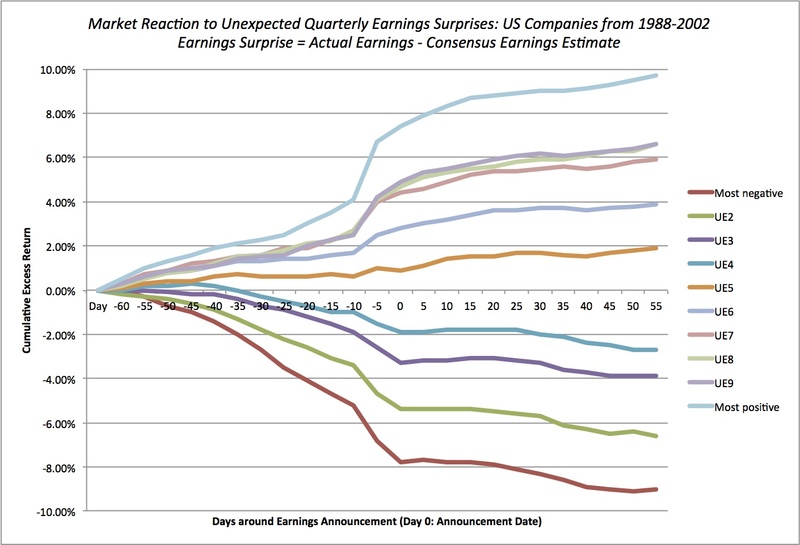 Thus, it is not the magnitude of the earnings change that matter but the “surprise” in the earnings, measured as the earnings change relative to expectations. But how do you measure expectations? One obvious answer is to use the analyst estimates of the earnings and news reports like this one generally compare the earnings change to the “consensus” estimate of earnings change to frame the report. A second is to use the “past” earnings growth for the company as a measure of expected earnings growth. With either measure, then, a positive (negative) earnings surprise then becomes an earnings report where the actual earnings per share exceeds (falls below) the expected value (using consensus earnings estimates or historical earnings growth). While you can use analysts or history as the basis for estimating expected earnings, the market expectations process is a more nuanced one and more difficult to model. In the last two decades, firms have become more attuned to playing the earnings game, and have become increasingly adept at beating earnings expectations by playing both sides of the game. First, they work on analyst expectations, using selective leaks to bring expectations down, prior to earnings reports. Second, they work to mold the actual earnings, using both accounting choices (earnings management) and operating discretion (timing of R&D expenses, for instance) to deliver results that beat expectations. The problem with this game is that markets catch on and adjust expectations accordingly. There are three interesting findings embedded in this graph. Pre-announcement drift: There is a mild drift in stock prices before earnings reports that is consistent with the eventual surprise: prices move up before positive surprises and down before negative surprises. I will let you make the judgment on whether this is evidence of insider trading, investor prescience or some combination of the two. Announcement effect: The announcement still contains news. On the announcement, the price effect reflects the magnitude and the direction of the surprise, with stock prices going up about 3%, on average, in reaction to the most positive surprises. There is one final aspect of the earnings game that may be affecting stock market reactions. As firms become adept at playing the game, managing expectations and tweaking earnings to beat expectations, investors have adapted. Firms that consistently beat consensus estimates now have to beat them by a "margin" (based upon their past history) to register a positive surprise. 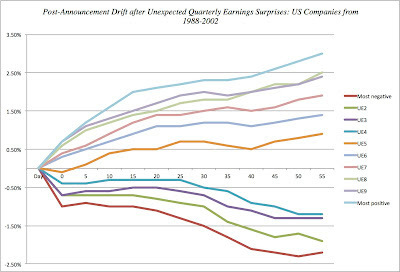 This is of course the phenomenon of "whispered earnings". With the Apple announcement due later today (July 24, 2012), the consensus earnings estimate is for earnings per share of $10.35 and the whispered earnings estimate is 67 cents higher at $11.02. The only problem is that Apple has beaten whispered earnings 42 out of the last 56 quarters. It is only a matter of time, I guess, before you have whispers on top of whispered earnings. My head hurts just thinking about the possibilities. So, how can investors play the earnings game? 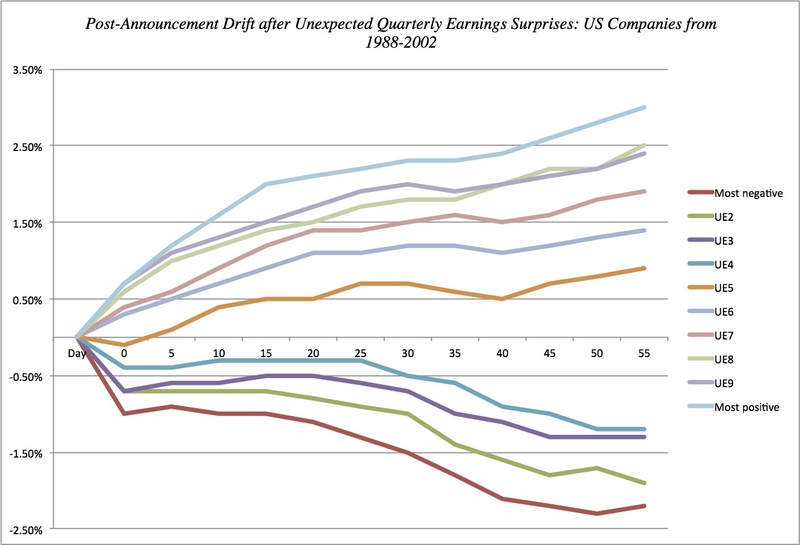 Using the earnings surprise graph as the basis for the discussion, here are some of the possible paths. a. Predict the surprise: You can try to devise ways of forecasting positive or negative surprises before they occur. I know it is easier said than done, but to the extent that you can stay on the right side of the insider trading law and find advance indicators of upcoming surprises (trading volume changes, price patterns etc.) you can profit. c. Play the earnings momentum game: While the first two strategies are short term, there is a longer term strategy that can be built around earnings reports. Studies indicate that companies that have consistently beat earnings reports over the last few quarters deliver higher returns in subsequent periods. Thus, in addition to screening for high quality growth and low risk, you can also screen for earnings momentum. d. Intrinsic value assessment: As a believer in intrinsic valuation, I look for ways to tie the information in earnings reports to intrinsic value. To do that, though, you need to look past the top line news (earnings per share) and at the underlying details (revenue growth, operating margins and return on capital). If you do so, you may very well find a report that looks positive on the surface (because the actual earnings exceed expectations) but contains enough negative news (lower revenue growth, declining margins and return on capitals) to cause intrinsic value to decrease. If the market misreads the report as "good" news and the stock price jumps up, you have the makings for a contrarian play. So, here is the challenge. By the time you read this post, the Apple earnings report will have been made public. Evaluate it and make your judgment on how (if at all) you will incorporate it into your investment strategy for Apple. I have attached my intrinsic valuation of Apple (made before the earnings report came out) with suggestions on how to incorporate the information in the earnings report into value. Take your best shot! On my web site, I update the equity risk premium for the S&P 500 every month, with my latest update of 6.17% on June 29, 2012. Even if you accept that estimate as a reasonable one for the US, there are many other estimation challenges. If you are valuing a Brazilian company, what equity risk premium would you use? What if you are valuing a multinational like Siemens or GE, with significant revenues in emerging markets, or an oil company with substantial reserves in Nigeria? More generally, in the face of globalization, valuing any company now requires an understanding of how best to evaluate country risk and convert into appropriate equity risk premiums. If you are working for a multinational, understanding how equity risk varies across countries is central to coming up with hurdle rates that vary across countries and lead to a fairer allocation of capital. Should equity risk premiums vary across countries? The question of whether equity risk premiums should be different for different countries, at first sight, looks like it has an obvious answer. Of course! After all, Venezuela, Russia and Greece are riskier countries to invest in than Switzerland, Germany or Canada and should have higher equity risk premiums. The answer, though, is not that simple. There are two scenarios where country risk will cease to matter and you will use the same equity risk premium for all companies, no matter which country they operate in. The first is if country risk is idiosyncratic, i.e., specific only to that country, with no spill over effects. If this is the case, diversifying geographically across countries should make this risk disappear in your portfolio, which can be accomplished by companies expanding their reaches across the globe (think Coca Cola or Nestle), or easier still, by investors holding geographically diversified portfolios. The second is to assume that all investors invest in global portfolios, in which case you could compute a global equity risk premium, capturing macro economic risks around the world, and estimate betas for individual companies against a global equity index. Both assumptions are difficult to sustain. The assumption that country risk is diversifiable is built on the presumption that the correlation across countries is low and that there is no contagion effect. That may have been true in the 1980s but as investors and countries have globalized, the correlation across countries has risen. Put differently, country risk is no longer diversifiable and requires a risk premium to those exposed to it. The assumption that investors are global is more reachable now than two decades ago, but institutional restrictions (Indian and Chinese investors still cannot invest easily overseas) and investor behavior (there is a substantial home bias in portfolios, where investors over invest in their domestic markets) still stand in the way. Bottom line: I think that equity risk premiums do vary across countries, with higher equity risk premiums applying to riskier countries. Applying the same equity risk premiums across companies will lead you to over value companies that have higher exposure to emerging markets. How do you estimate equity risk premiums for different markets? If you accept the premise that equity risk premiums should be different for different market, the question of how best to estimate these premiums follows. You cannot obtain these premiums using historical data, i.e., by looking at the premiums earned by stocks over riskless investments within each of the markets. Why not? First, there may be no riskless investments in many of these markets, either because governments may have default risk or because government bonds were not issued/traded over the period. Second, these markets are changing so much over the historical period in question that the historical premium you get over the period is not a predicted premium. Third, and more important, equity markets are volatile and the equity risk premiums over 20,30 or even 50 years of data have estimation errors that drown out the estimate. Government bonds in US$/ Euros: If the country in question has dollar or Euro denominated bonds, you can estimate the spread over the US treasury bond or the German ten-year bond rate respectively. Sovereign rating: Moody’s, S&P and Fitch all assign sovereign ratings to countries. You can estimate a typical default spread, based on the sovereign rating, using a lookup table that I update at the start of each year. Using Peru as an example, the sovereign rating of Baa3 for the country yields a default spread of 2.00%. Here are the latest local currency and foreign currency sovereign ratings from Moody's. CDS spreads: The Credit Default Swap market is of more recent origin, but it is a market that allows you to buy insurance against default risk (see my earlier post on this market). Thus, if you bought a 10-year Peruvian government bond with an interest rate of 4.5%, and were concerned about default, you could have bought a 10-year Peruvian CDS. The price of that CDS in June 2012 was 2.06%, effectively implying that you would need to pay 2.06% out of your 4.5% each year for the next 10 years to get default protection. If you are interested, here are the ten-year CDS spreads for all of the countries where they are offered as of June 30, 2012. While this approach has intuitive appeal, its weakness is that the equity market volatilities are as much a function of country risk as they are a measure of liquidity, with less liquid markets (which are often the most risky) having higher standard deviations. Here are my estimates for emerging markets as of January 2012. There is one other approach, where you are not dependent upon knowing the mature market premium, historical volatilities or default spreads. You can compute an implied premium for an emerging market, based upon the level of equity prices and expected cash flows. While this is what I do for the S&P 500 each month to get the implied premium for the US, it is far more difficult to use in emerging markets, because of data limitations. Where do you use this equity risk premium? Equity risk premiums come into play at every step in investing. At the asset allocation stage, where you determine how much of your portfolio you will be allocating to different asset classes (equity, fixed income, real assets) and to different geographical areas, you have to make judgements of which markets you are getting the best risk/return trade off and allocate more money to those markets. If the company breaks down revenues into regions rather than counties, you may have to compute a premium by region (Latin America, South Asia, Eastern Europe, Sub-Saharan Africa etc.) and take a weighted average. In relative valuation, the use of country risk is usually implicit or qualitative. Thus, when comparing the PE ratios for oil companies, you may choose not to buy Lukoil, even though it trades at a lower PE than Conoci, because you worry about Russian country risk. If you want to be more explicit about how much to adjust multiples for country risk, download my spreadsheet for computing intrinsic multiples and change the equity risk premium to see how much PE or EV/EBITDA multiples change as the equity risk premium changes. I update country risk premiums, by country and region, at the start of every year. Given the turmoil of the last six months, and dramatic changes in country risk (especially in Europe), I have updated the numbers as of June 30, 2012. You can get the latest version of my estimates of country risk premiums by clicking here. If you want a blow-by-blow account of my reasoning on equity risk premiums, you can be a glutton for punishment and download my paper on equity equity risk premiums (the 2012 version).